"I'm going to look like a laser beam in terms of how this impacts economic growth and what it'll mean for a budget," Lamont said. He takes over as governor on January 9, 2019. Lamont and his team welcomed members of the public and about 400 stakeholders to a transition team policy summit at Eastern Connecticut State University on November 27. 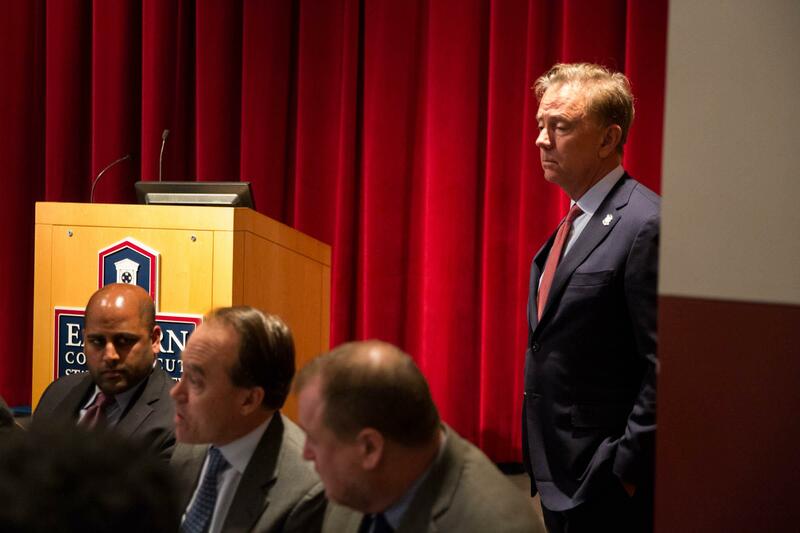 Ned Lamont wants to focus on job creation and economic development as he prepares to assume Connecticut’s governorship. He and Lieutenant Governor-elect Susan Bysiewicz convened legislators, municipal leaders, and policy makers at Eastern Connecticut State University on Tuesday to help the Lamont team assess important issues in its transition. Those who attended were put into specific policy committees. They included subjects as diverse as agriculture, social services, and transportation. But in the end, the stakeholders at the summit were all given one directive from Governor-elect Lamont – develop opportunities for job creation and economic growth. Participants broke into 15 groups defined by various policy issues as part of the November 27 summit. Here, Lamont listens in on the jobs and economy committee. All kinds of people attended the event including Democratic state Representative Tony Guerrera, Connecticut Business and Industry Association President Joe Brennan, and Erin Stewart, the Republican mayor of New Britain. “It’s because you volunteered. You told Ned and I along the way that you wanted to help and maybe you’re a little surprised that we took you up on it,” said Lieutenant Governor-elect Susan Bysiewicz when she explained why each stakeholder scored an invite. The team hopes that it can develop a plan of action in the next three weeks based on what the 15 policy groups discussed at the summit. Lamont said that his transition team is actively working with the Office of Policy and Management to determine budgetary figures. Connecticut’s next governor will be Democrat Ned Lamont. Republican Bob Stefanowski conceded the race to his opponent just before 9:00 a.m.
Governor-elect Ned Lamont announced his transition plans Thursday on the steps of the state capitol. Lamont says that he'll have two transition groups -- one focused on the budget, and the other on economic development.